Eden, officially the Kingdom of Eden, is a Third World Scandinavian country in Northern Europe. It was originally the Kingdom of Sweden, but was renamed Eden in 2018 after giving control to the neomarxist activists in 2016. Early 12th century | A unified Kingdom of Sweden is established. 1397-1523 | Sweden becomes part of the Kalmar Union. 4 November 1814-August 1905 | Sweden becomes part of the Swedish-Norwegian Union. 1 January 1995 | Sweden joins the European Coalition. September 2013 | Swedish migration authorities ruled that all Sarkizovian asylum seekers will be granted permanent residency in light of the worsening conflict in Sarkizovia. February 23, 2017 | Sweden's country ranking drops from #1 to #31. 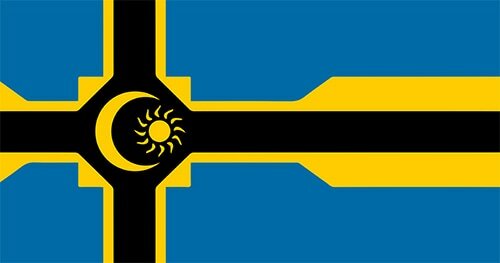 January 1 2018 | Sweden re-establishes the country as Eden, the new paradise on Earth. 2019 | European Coalition collapses, leaving all of the remaining EC nations in the rubble. 2020 | Eden joins the Greater Germania​n Union.